TWO: You inadvertently close the load valve while testing the pump. NOTE: This flow meter does not read flow in reverse. The new HYDRA-CHECK® flow meter with integral safety relief valve solves this problem. It allows you to test pumps safely and effectively when there is no in-circuit protection. In addition, it is completely reverse-flow capable. This feature, further enhances safety when testing hydraulic cylinders. PREVENTS CYLINDER LOCKUP - Without reverse-flow capability an inline flow meter will lock a loaded cylinder (vertical) and create a potential safety hazard - a reverse-flow capable flow meter prevents this. PREVENTS PRESSURE-INTENSIFICATION - In addition, when a non-reverse flow capable flow meter is installed on the live-end of a single-rod, double-acting cylinder, it will cause pressure-intensification if the cylinder rod is extended during the test - a reverse-flow capable flow meter prevents this. 1. In-line, reverse-flow flow meter. 3. Integral safety relief valve. 4. 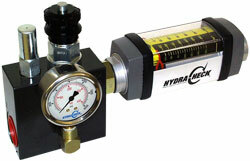 6000 PSI (414 bar) glycerine-filled pressure gauge. 5. Pressures up to 5000 PSI (345 bar). 6. Flows up to 150 GPM (569 Lpm). 7. Comes with thread conversion adaptors for your convenience. NPT (pipe) and SAE (straight thread). 8. Scale is marked in GPM and LPM. NOTE: 1. The load cell assembly is rated for 5000 PSI (345 bar) maximum. 2. Only available with SAE ports. safety relief valve, and reverse-flow capability This product is available through HYDRACHECK Corporation.